Tanya Grants | Mr Bones & Co. The longer a dog stays in a shelter, the more stigma that dog faces. Tanya Grants were inspired by our girl Tanya, who sat in a New York No-Kill Shelter for seven years before we found her in November 2013 and pulled her into our One Lucky Pup program. 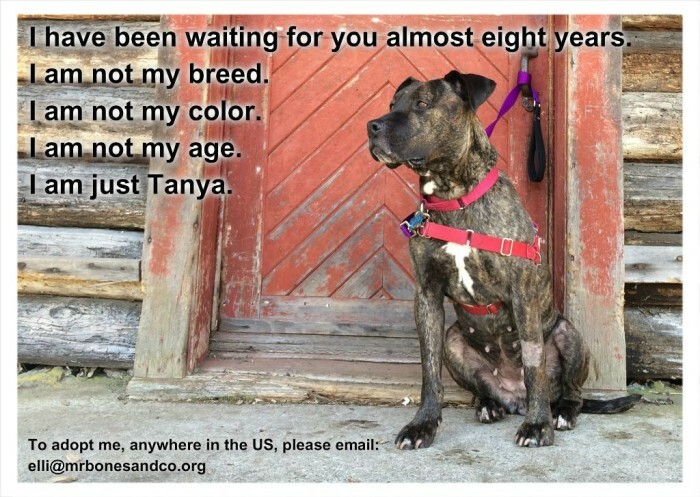 Tanya is a great dog, but the longer she waits to be adopted, the more everyone assumes there is something wrong with her, which is absolutely not the case for her, and is often not the case for many other dogs languishing for years in shelters, being overlooked and second best for far longer than they deserve. These grants provide $250 worth of training to the adopters of a dog that has been at their local shelter the longest. Adoptions must be verified by the shelter and training must be with an accredited trainer. Mr. Bones & Co. awards 25 grants per year. If you are an adopter considering your shelter’s longest resident, or a shelter who would like more information, please email us at info@mrbonesandco.org. Tanya is still waiting to be adopted. Please share her story and help her find the home she has been trying to get to for almost eight years. You can read more about her here.